Teacher approved Cecilio CVN-100 violin is perfect for the student musicians. It features hand-carved solid spruce top, hand-carved maple back and sides and finished with a beautiful natural varnish and inlaid purfling. The CVN-100 violin is strung with a set of D'Addario Prelude Strings and is fitted with maple pegs, fingerboard, chinrest, and with an alloy tailpiece with 4 built-in fine tuners. 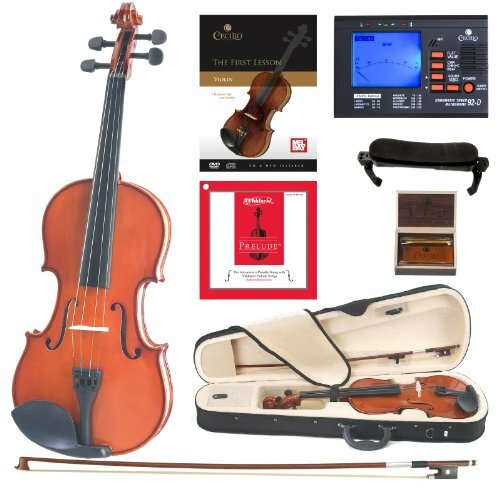 Violin package includes a Cecilio chromatic tuner with metronome, a lesson book, a lightweight form fitting hard shell case with pockets and strap (making it convenient to carry to school or orchestra), a Brazil wood bow with unbleached genuine Mongolian horsehair, quality rosin cake, adjustable shoulder rest with soft foam padding & soft rubber feet, and a violin bridge. Buy with confidence as it comes with a 1- year warranty against any manufacturer's defects. If you have any questions about this product by Cecilio, contact us by completing and submitting the form below. If you are looking for a specif part number, please include it with your message.